Have you always wanted to learn how to speak French but simply didn't have the time? Well, look no further. This is the most advanced and revolutionary method that was ever designed for quickly becoming conversational in a language. In creating this time-saving program, master linguist Yatir Nitzany spent nearly three years examining the 27 most common languages in the world and distilling from them the 350 words that are most likely to be used in real conversations. The drills are narrated by a French speaker and guaranteed to help you learn and practice correct pronunciation - as it is spoken today. Each drill is five- to six-minutes long and is very easy to do. You can listen to the drills practically anywhere - in your commute, while driving or running, or during any free time you have. Tenses that are barely used in actual speech such as passé simple and plus que parfait are not included in the drills so you could focus on the essentials. The Audio was very good. The pronunciation was very clear. The man's tone of voice was very calm. I especially liked the interactive part. It gives you a chance to practice, to find the answers yourself and then compare it to his answers and how he pronounces them. This is a great way to learn the french language and I definitely recommend it to all who are trying to learn. It gives you a chance to practice, to find the answers yourself and then compare it to his answers and how he pronounces them. What about Frederic Bibard’s performance did you like? Yes, his tone of voice was calm and relaxing. His pronunciation was very clear. Timing was good. This is a great way to learn the french language and I definitely recommend it to all who are trying to learn. This method really helps to develop a correct conjugation of verbs (which is necessary for speaking in a clear manner in any language) thanks to the different drills it contains. The PDF visual aid is key for people like me that have visual memory while I can exercise the pronunciation and follow the audios at the same time. Also the smooth and slow voice of the narrator is a plus for it because it gives you time to repeat the phrases slowly, making the memorization step easier. Definitely recommended! I found this method of learning verb conjugation very enjoyable. I have always wanted to brush up my French conjugation and this book was just the thing to help me with that! My pronunciation has improved dramatically because the author teaches you the verbs as they are spoken in France today. I am much more comfortable speaking now that I feel confident that I can conjugate verbs correctly. The drills give you practice in random order and give you time to figure out the correct answer yourself, and that has been very helpful. This is a product I would highly recommend. Great audiobook! I love how the speaker explains the method used before beginning the drills. I also appreciate the fact that he pronounces each verb slowly and allows a brief pause for you to do the same. Not only do you get to hear the word used slowly, but he then repeats the list of verbs at a normal pace so that you can get the feel of how the words sound when having a normal conversation in French. I find this super helpful for someone who has not taken a French course in a while and needs a refresher on pronunciation. I thoroughly enjoyed this audiobook. Listening and repeating the phrases is very helpful while learning to put together conversations in French. I actually love this method of learning another language. The drills gave me a lot of time to actually learn the conjugation of the verbs. First doing it slowly to get the pronunciation then as if you are speaking, you can hear how the natives put it together. I feel more comfortable saying these drills outloud than any other teaching I tried. Good audiobook to have. What made the experience of listening to French Verb Drills Mega Bundle the most enjoyable? 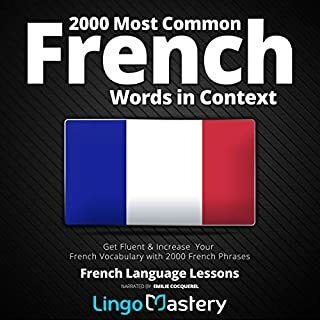 This audiobook provides essential verb drills that will greatly assist those who are studying French. Of particular note is the manner in which you are guided first in a slow and then in a quicker process with the narration of a native speaker. It is an immersive experience that will assist language learners in natural speaking and listening skills. 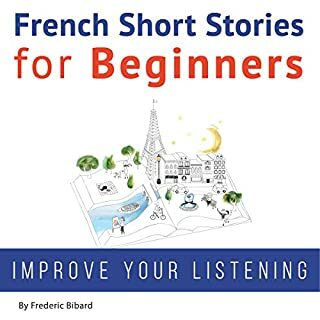 "Having taken some lessons in the past, for me was great this audio book focused in some of the most important and commonly use verbs in the French language. The author’s pronunciation is clearly good, but sometimes his strong accent causes me some trouble to understand the short explanations in English. On the other hand, I was pleasantly surprised by the repetition system results in all his variations. Soon I started to develop a natural reflex to clearly identify the right words along the drills, and now I feel more confident with my skills. Besides, the book offers a text version in PDF, which is a great way to integrate the writing learning and gives you a visual reference for a better focus. Very useful if you already know some basics!" Would you listen to French Verb Drills Mega Bundle again? Why? Would you recommend French Verb Drills Mega Bundle to your friends? Why or why not? If you could sum up French Verb Drills Mega Bundle in three words, what would they be? What was one of the most memorable moments of French Verb Drills Mega Bundle? It's really helpful that this audiobook is designed for you to practice verbally so you can repeat it after the narrator as he adds a pause for practice. He's French and he says it 2 ways, how its supposed to be said slowly and how french people actually say it which is very quickly so the words blend together a bit. Its a different sound and important for oral comprehension. Its 16 hours of grammar so its best to study it over time. I really like that he begins with the verbs that are used the most in conversation in French. I would highly suggest using the website or emailing for the free PDF as French is often spelled differently than pronounced. 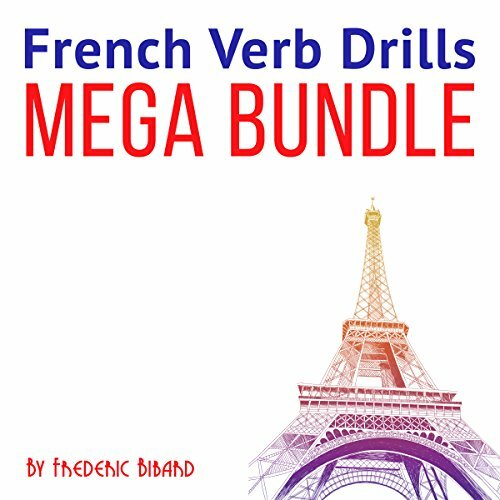 What did you like most about French Verb Drills Mega Bundle? the writers use of repetition. the witers explaination on when to use the verbs and the fact that he explained in English. What does Frederic Bibard bring to the story that you wouldn’t experience if you had only read the book? I didn't have an emotional reaction to the book but it made me laugh. Understanding the French language is one thing, but speaking in the right tenses has been the most complicated bit to me. This book helps to simplify ones understanding of conjugation, as the writer takes time to conjugate in each tense more than once. The more you read out with the writer the more you get an understanding of when and how to use your tenses. 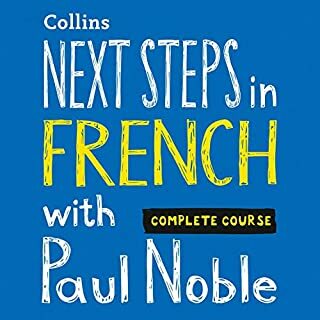 I would definitely recommend this audible book to anyone who is looking to perfect their use of the French language. This Audio Book really helped me improve my pronunciation and verb conjugations make more sense to me now. I have learned very useful things like when to use a specific tense or which form of interrogation is normally used. I liked that I was given the possibility not only to repeat the verbs, but also to check what I learned as the drills give you practice in random order. Great way to learn. 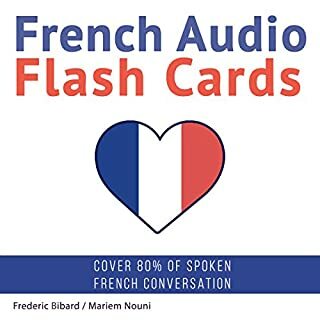 This audio is a fantastic way of breaking down French verbs, using a simple method. The pauses are long enough to be able to repeat the verbs and then listen to the way they should sound - further enhancing my pronounciation. 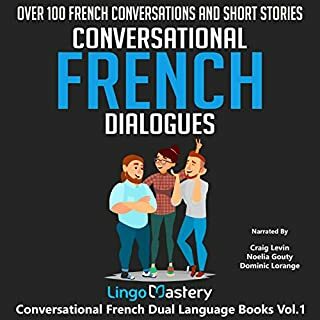 The narrator translates each verb at the beginning of each chapter and how they would be used in French, which I have found to be very useful. This book is extremely great if you have started French, and want to get the hang of verbs and tenses. This requires you to have some idea of French basic pronouns beforehand, but nothing very complicated. Frederic Bibard allows you to repeat after him, at first slowly, followed by a quiz which lets you practise in normal pace. Which gives you adequate time to try something by yourself the first time you start listening to the audiobook. The way it’s presented in is short, simple, and each chapter is divided according to the verb taught – so you can go back to any chapter for the verb that you want to refresh on. The free PDF that comes with the audiobook is really helpful, as well. Particularly if you want to practise writing and spelling. I also like Bibard’s performance. As someone who’s taken a lot of French classes, it’s very important to get the assistance of someone with the perfect accent so you can receive as much real-life experience is possible. And I’ll say the book excels at this. Overall, it was a great experience. The shot and to-the-point works great, especially if you are a busy person, all you need is to give is 5-6 minutes per verbs. I’ll wholeheartedly recommend this book to anyone who is starting French. It is a great way to solidify learning using a passive method- I have found that my pronunciation has improved as well as my confidence with french verbs and how they work. They have started to become second nature to me. A great product and enormously helpful. I felt that the professional narrators hired by Olly Richards were far superior, and therefore the material easier to listen to. Writers should not attempt to be actors, but hire actors that can best portray the material. Notable exception are audio books by Sylvie Laine. The book teaches listeners the French grammar, starting from very basic phenomena to more complex. I like the fact that not only does the author teaches us new verbs/phrases but he also makes us think - he uses repetition and pauses in order to give the listeners time to think about the answer before he actually provides the correct one. Although you can hear the French accent in the author's English, he speaks in a slow and comprehensible way. To start off with the good stuff - I really like Frederic Bibard's voice - it's like listening to dripping honey! And he's hit on a good formula to teach some French verbs, the repetition must help it all stick in the mind. Great and simple way to learn French! 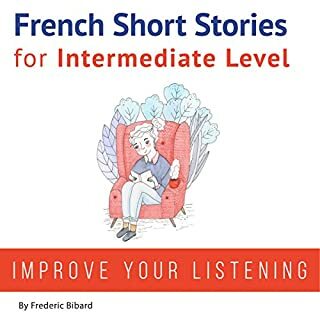 I have found this audiobook really interesting to learn French effectively. The author basically conjugates lots of verbs in different tenses, forms (negative interrogative etc.) and for each person. It reminds me of when I had to learn by heart all the irregular verbs in English. What is interesting is the author will conjugate the verbs very slowly and faster so that you can be accustomed to real French people talking. Really practical! Ialso like the idea of the quiz that follows the order of the conjugation and the random one. It's a good way to practice, he gives you time to actually answer before giving the right answer afterward. It is really good if you are serious about learning French and you can listen to it during your spare time while commuting. French natives have to go through this learning anyway at school. It is very thorough and it feels like you are physically taught by a teacher.